Twelve years ago, Kauai’s newest mom, RO28, was born in nearly the same spot she gave birth last week. While monk seals tend to have unique personalities and proclivities, it’s not uncommon for females to return to their natal beach sites when it’s their time to give birth. In fact, RO28 has pupped along the same stretch of coastline for six years in a row. What’s more unique than that is the fact that RO28’s six pups are all still alive. With all the threats facing Hawaiian monk seals–entanglements in marine debris, ingested fish hooks, intentional harm by humans, and the growing threat of toxoplasmosis–somehow all of RO28’s six pups have, thus far, evaded them all. Point of note: RO28’s mother was RK06 who was shot by a fisherman in 2009. Even RO28 herself has run into some challenges. In 2010, she turned up with a fishhook in her mouth. Shortly after it was removed, she crossed the 100-mile open ocean channel to Oahu where she spends most of her time–until it’s time to give birth. Then, she makes the return journey to her natal site. Within a few days of arriving, she pups. The timing is impressive. In 2015, RO28 gave birth to RG28 who often hauls out on Kauai’s South Shore. This birth was captured on video by one of our volunteers and can be seen here. And, as always, if you’d like to volunteer with the Hawaiian Monk Seal Conservation Hui on Kauai, please email kauaiseals@gmail.com. And if you run across any seals on the beach, please take a quick health assessment and report any sightings to the hotline–808-651-7668. Pup-date! As you know from previous postings, four Hawaiian monk seal pups were born on Kauai in 2015. Here is a synopsis of where they are today and how they are doing. The oldest pup, RG13, is now 7 months old and has become a somewhat elusive north shore seal with sightings ranging from Papa’a to Ha’ena. A snorkeler saw her underwater at Tunnels last month looking healthy, normal, and most importantly behaving like a wild seal that made no attempt to interact with the swimmer (and vice versa!). The next pup, RG22, is now 6 months old and has moved to the south shore where he was sighted last month wearing (entangled) someone’s swim goggles! They fell off within a couple of days and caused no harm. Since then he has been sighted routinely hauling-out along the rocks in the Makahuena Point area. The third pup, RG28, has not been sighted for several months, however this is not uncommon as these young seals often tuck into quiet rocky locations and are not sighted very often. For example, another young Kauai seal, RN30, was born in 2013 and completely fell off our radar for 16 months (between May 8, 2014 until September 27, 2015) but has now been sighted weekly looking extremely healthy. We hope the same is true for RG28. 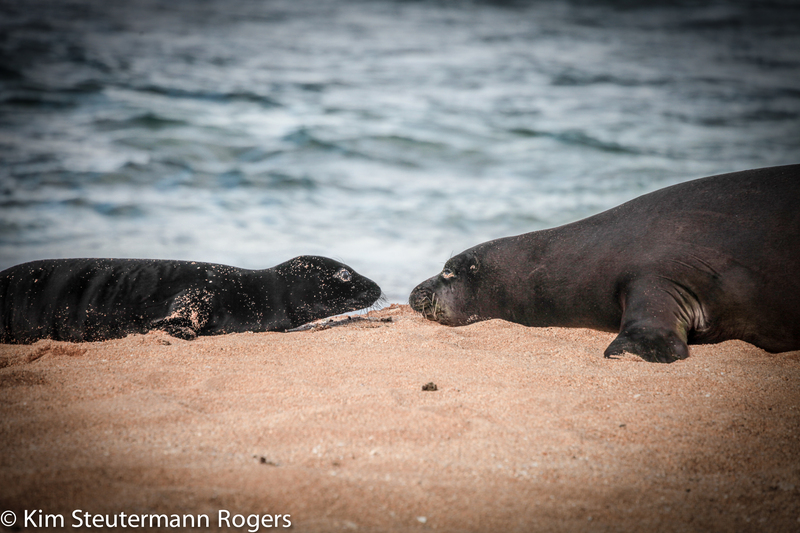 The youngest pup, RG58, is still only 4 months old and is sticking closely to his birth beach on the north shore. He was a really big pup measuring almost as big around as he is was long, like a beach ball with flippers. This thick layer of blubber gives a naive pup a great energetic advantage while learning to forage and fend for itself during the critical time after weaning from their moms. As you can see from this recent photo, he continues to maintain a healthy body condition. 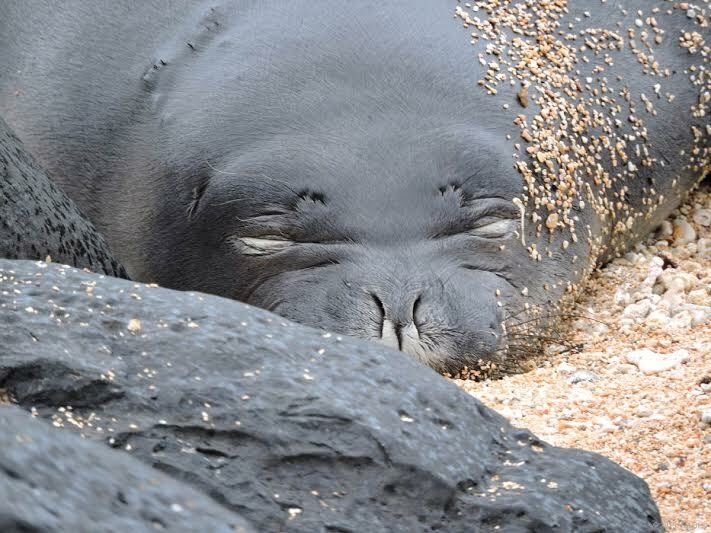 You know what they say about marine mammals…blubber is beautiful!